Physical characteristics: Rufous-browed peppershrikes have a somewhat heavy body, large head, and heavy bill. The back is dark olive-green, chest and flanks are yellow, the belly is white, and the top of head is gray with a broad rufous (reddish) stripe over the eyes. Males and females look alike. They are 5.5 to 6.0 inches (14 to 15 centimeters) long. Geographic range: They are widely found in Central America from southeastern Mexico to Panama, and in parts of South America as far south as central Argentina (but are not found around most of the area affected by the Amazon River). Habitat: Their habitat consists of both dry and moist evergreen forest borders, scrublands, gallery and secondary forests, and clearings with trees. The birds are found at altitudes up to 9,200 feet (2,800 meters). Diet: The birds feed on insects, caterpillars, and other invertebrates found on foliage, flowers, and tree limbs. They also eat small fruits. 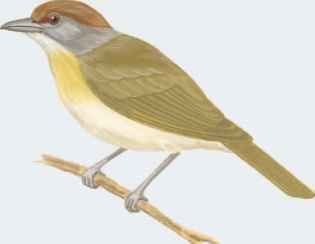 Behavior and reproduction: Rufous-browed peppershrikes move about in trees with sluggish movements. They usually stay in the thicker parts of the foliage, so are more often heard, rather than seen. The birds do not migrate, but do defend their breeding territory. Their song is a repeated, musical phrase that is sung year-long. The type of song differs depending on individual birds, and where they are located in their range. The birds stay together throughout the year. They build cup-shaped, thin-walled nests from grasses, which hang from a fork of a high tree branch. Both the male and female incubate the eggs and feed the young. Rufous-browed peppershrikes and people: There is no known significant relationship between people and rufous-browed peppershrikes. New World finches consist of buntings and New World sparrows. They are small- to medium-sized birds, with a short, conical bill, medium-sized legs, rather large feet, and a short- to medium-length tail. The bill's upper and lower parts can be moved sideways in some species. Most species have dull black, brown, olive, gray, or beige plumage (feathers), but some species are brightly colored in rich chestnut or pale buffy browns with white or black areas. All have wings with nine main feathers, although a short tenth may be present. Faces contain patterns of black, white, and buff, sometimes with yellow or buffy orange stripes. Males are generally larger than females. 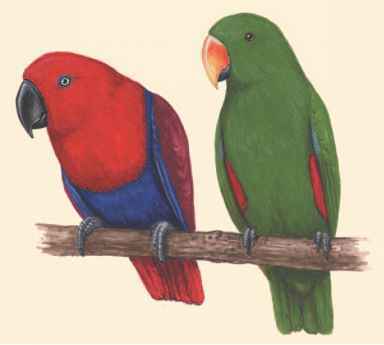 Sexes look alike in plumage in most species but are very different in others. New World finches are 4.0 to 9.5 inches (10 to 24 centimeters) long and weigh between 0.3 and 2.6 ounces (8 and 75 grams).